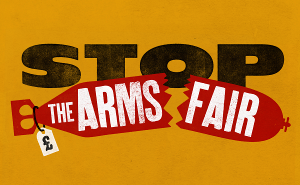 Every year, the UK arms trade holds a fancy black tie dinner at Grosvenor House Hotel in London. On the 23rd January 2019, the Aerospace, Defence and Security dinner will bring arms dealers, MPs and military personnel together to schmooze, swill champagne, and feast on expensive food. At the same time, 14 million Yemeni people are at risk of famine, starved as a result of the Saudi-led coalition’s bombing of their country. Many of the bombs are made by the arms companies present, and have been sold with the support of the politicians in attendance. The war in Yemen has caused the worst humanitarian crisis in the world. More than 85,000 children under the age of 5 have died from malnutrition. The fighting and the Saudi-imposed blockade have caused a cholera outbreak that has affected over 1.2million people. The UK government is directly involved in causing this suffering. It has licensed almost £5billion of weaponry to the Saudi regime since the bombing began in 2015. UK-made planes are dropping UK-made bombs in Yemen. We will not let those profiting from and enabling this war celebrate unchallenged. Their trade causes death, starvation and devastation across the world, and particularly in Yemen. JOIN US outside Grosvenor House to highlight this disgusting hypocrisy and demand that the UK #StopArmingSaudi.